After a great night's sleep at the coolest campground ever, we took a stroll to a local diner for very tasty breakfast. Full of biscuits and gravy, we waddled back to the moose to await the arrival of our special passenger for the next leg of our journey. 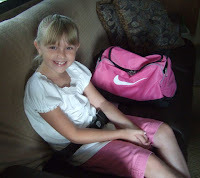 Our grand-niece joined us for the trip to Salina. She helped us get ready to go and made herself comfortable on the sofa. About two hours later we arrived safely in Salina and enjoyed a nice lunch at Paul's sister's home. Then, we found our way to the Salina KOA. It'll be a fine place to spend the next three nights. 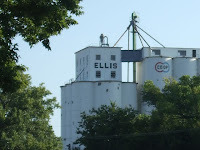 But, as expected, it doesn't hold a candle to "our place" in Ellis! While we're playing in Salina, here's a little quiz for you. Below are two pictures. Both were taken on I-70 between Denver and Salina. One is in Colorado. The other is in Kansas. Picture #1 - Rolling hills, green grass and plenty of trees. Is it Kansas or Colorado? Picture #2 - Straight highway, not a tree in sight. Is it Kansas or Colorado? Halfway between Denver and Kansas City there's an exit on I-70 that delivers you smack dab in the middle of Ellis, Kansas. Population: 2000. After a long day of downhill driving, this was our intended destination for the night. Why Ellis? Because it has the coolest campground ever! 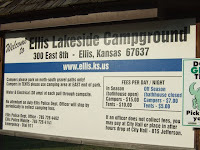 We spotted the Ellis Lakeside Campground last fall when we were here (in a rental car) for a family wedding. We saw it as we entered the church. After the ceremony, we cruised through the place and liked it so much we made it a "must stop" on Bullwinkle's first pass across Kansas. There's the church right there, just across Big Creek from the campground. So, what makes this the coolest campground ever? Well, if that view across the creek isn't enough for you, we'll fill you in. 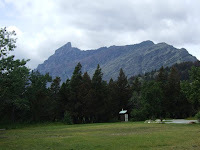 This campground is a city park with 16 wide, level and shaded gravel pull-through sites with spacious grass areas, a picnic table and fire pit. All of the sites face Big Creek (aka Ellis Lake), which is less than 50 feet away. The campground sign provides all of the essential information you'll need for your stay. We'll point out a couple of key features. First, campground fees are collected by the Ellis Police Department. (Paul had a great "small world" conversation with the fine officer who stopped by our place shortly after we were set up.) So, you know the place is safe! Second, about those fees. 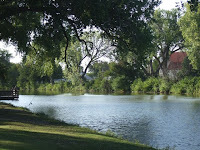 While we think this very pretty, peaceful spot is priceless, the City of Ellis charges a mere $15 a night. Add $3.95 and you get smokin' hot wifi, too. Too bad we can't stay longer. Tomorrow, we're off to Salina. Something tells us the KOA there won't be anything like this cool little place. We have maneuvered our way safely through Denver traffic and are camped at our lovely home for the next three nights: Cherry Creek State Park. More when we can connect. Much of our "extra day" in Cheyenne was spent hanging around the moose. We all slept in and got the rest we needed. Paul went for a run, while I caught up the blog. 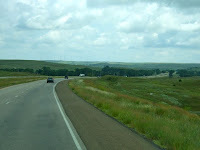 Then, we decided to see what there is to see in this city on the high plains. Cheyenne is very proud of its historic district, and rightfully so. The train depot has been restored and today serves as a visitor information center and home of a very fun looking brewpub. On this Monday afternoon things were pretty quiet in downtown Cheyenne. This is a view looking up Capital Street. If you look really closely, you can see the Wyoming state capitol in the center of the photo. While we were downtown, we stopped in The Quilted Corner, a lovely shop on West Lincolnway. 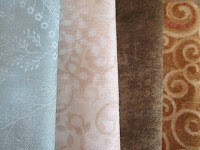 I selected these four fabrics to represent Wyoming. The proprietor agreed they were good choices, especially the two on the right. She and Paul had a nice chat while I browsed and had a flash of inspiration selecting a pattern for the quilt this stately collection of fabrics will go into. It was a great stop and a nice shop. We both recommend it! The quilt shop lady told us the "must do" thing for the afternoon was a visit to Lions Park. We've quickly learned that when locals give you such enthusiastic advice, you go with it. 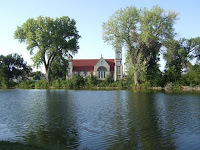 The drive to Lions Park took us through some of Cheyenne's most charming and well kept neighborhoods. Unlike many of the towns we've visited this summer, we did not see but a handful of "for sale" signs. Things in this part of Cheyenne seem pretty solid. 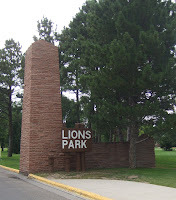 Lions Park is an oasis on the high plains. It features a lake with a beach, walking paths, gobs of green space and a museum or two. 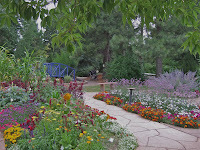 The centerpiece of the park is the Cheyenne Botanic Gardens, a nine-acre display of beauty, community and sustainability. Me? I like the flowers! 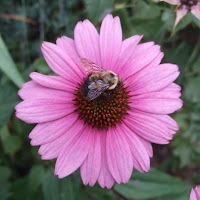 Apparently, so does this busy bee. Paul took a seat and fired up the GPS. Turns out there was a cache just a few yards away between the solar conservatory and the herb garden. It was one of three finds we made in Cheyenne today. 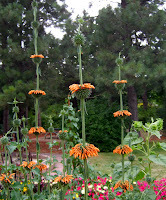 While Paul went looking for the cache, I took a stroll through the Peace Garden. 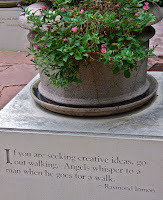 This quiet corner of the gardens features notable quotes about life, love and - of course - gardens. As an avid walker, I appreciated this one. This has always been one of my favorites. It has special meaning right now! We could have spent the rest of the afternoon enjoying the park, but Mother Nature had other plans. A steady rain began to fall, so we headed back to our trusty KOA and settled in for the night. 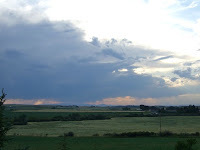 Tomorrow we have a short drive to Denver, where we hope we'll be staying at Cherry Creek State Park for three nights. (We don't have reservations, but our fingers are crossed!) Wifi is doubtful at this place, so it may be awhile before we're able to update the blog. We look forward to seeing my brother and his family and our friends Mike and Kathryn while we're in the Mile High city. Provided we have a place to park, it should be a great stop. We climbed a lot today. Bullwinkle was working hard to tackle 6,000 feet in the heat. Sitting on top of that loud V10 engine, the two of us talked about a diesel pusher in our future! (Actually, we practically had to shout!) 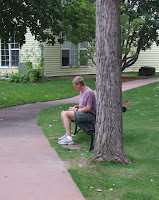 Eventually, we coasted into Cheyenne and made our way to the Cheyenne KOA. After three consecutive travel days, and a forecast for cooler temps and more isolated storms tomorrow, we've decided to stay two nights here and chill out. 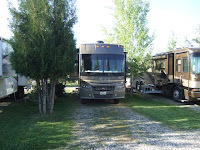 With nearly 900 miles behind us since leaving Polson, the moose, squirrel, cats and us are all ready for a rest. We'll head for Denver on Tuesday. The word of the day is "vast". That's how we can best describe Wyoming. There's a heck of a lot of space out here! 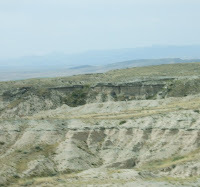 We covered 346 miles today, which is a lot when you're driving a motorhome and pulling a Jeep across Wyoming. Thankfully, the miles were uneventful until, once again, we neared our destination for the night in the not-so-booming metropolis of Kaycee. We followed the signs off the freeway to Powder River RV Park. When we made a turn into "downtown" Kaycee the pavement came to an end and was replaced with narrow (and we mean NARROW) temporary lanes bound by tall orange pylons. With one half mile to go to our destination we saw a large "road closed" sign. Just beyond the sign there was a mini-Sturgis motorcycle gathering underway in the street with bars on either side. 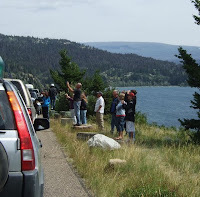 Yep, after logging nearly 350 miles, we were stuck with our moose and squirrel and a bunch of bikers in the middle of nowhere Wyoming. We made a turn of faith onto a "side street" and tried to suss things out. Paul trekked a potential detour only to discover that things that way went from bad to worse. We placed a second call to the park for help. 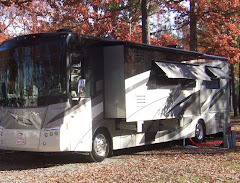 Upon learning that the man taking my call was at "the other" RV park in town (Apparently this RV baron owns both! ), I asked where he was and if he had a space. His answers were "the other side of the highway" and "yes". Our escape from downtown Kaycee was neither swift nor easy. Getting turned around was relatively simple. But, making the turn back on to the main drag was tight. 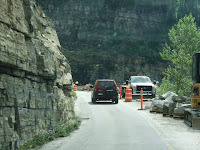 The placement of the pylons on the rough gravel turned out to be narrower than Bullwinkle is wide. 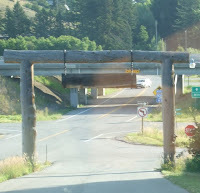 I made my presence known in this tiny town with a loud expletive as I made a hasty exit to extract three of the pylons wedged under the moose. No, the Kaycee Chamber of Commerce (if there is one) won't be inviting us to speak at their lunch meetings anytime soon! At last, we made it across the highway to the K.C. RV Park and Cabins. As far as RV parks go, this place left a lot to be desired. But, with 50 amp service and water, we have all that we need for the night. No wifi and sketchy cell service here. But, where else can you see sheep grazing around your campsite? After a day of battlefields and bikers, we're looking forward to moving on to Cheyenne tomorrow. On a very long day of driving, we made a far too brief stop at the Little Bighorn Battlefield National Monument and Custer National Cemetery. We flashed our National Park Pass (Love it!) for free entry to this slice of history. 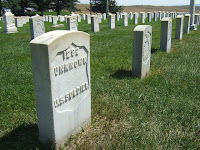 The first stop on our warm walking tour was Custer National Cemetery, which was established in 1886. 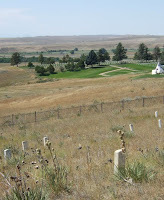 The National Cemetery is located just down the hill from Last Stand Hill, where General George Custer and approximately 41 men fell in the Battle of Little Bighorn in 1876. 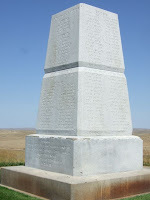 Four years later, the Army erected 249 headstone markers across the battlefield to show where Custer's men had fallen. Boston Custer, one of two brothers and a nephew who died in the battle, lost his life on Last Stand Hill. In 1881, the remains of the soldiers, scouts and civilians killed in the battle were reinterred in this memorial near Last Stand Hill. Interestingly, the remains of the officers - and Boston Custer - were removed to various cemeteries across the country. 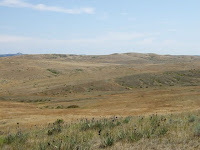 During the fight on Last Stand Hill, the Lakota and Cheyenne occupied nearby Wooden Leg Hill. Standing on this rugged piece of ground on a hot summer day, you can get a sense of the triumph and tragedy of that historic event. In 2003, National Park Service dedicated the Indian Memorial to remember the Lakota Sioux, Cheyenne, Arapahoe, Arikara tribes and promote the theme of "Peace Through Unity". The memorial features this sculpture, "Spirit Warriors". 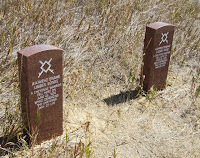 In 1999, the Park Service launched the Warrior Markers Project and began placing red granite markers on the site to mark the locations of fallen Indians on the battlefield. 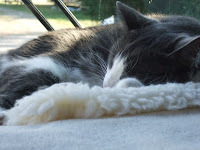 With temperatures approaching the century mark - and Bullwinkle's generator running to keep the kitties cool - we cut our visit short. We just barely scratched the surface of all there is to see here. We're grateful for the chance to visit this sacred ground. 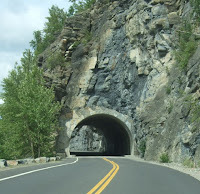 And, we look forward to spending a day here (which you could easily do) the next time we pass this way. The temperature was over 90 when we pulled into our cozy little site for the night. These sites are long, but not very wide! Depending on your point of view, Rocky is looking especially gnarly or grungy. Those miles without pavement piled on some serious dirt. With our long pull-through site, there was no need to unhook the squirrel. That'll make for a quick getaway tomorrow. Our last night in Big Sky Country did not disappoint. The sunset view from the campground was magnificent. We so wanted those distance rains to come our way. The moose and squirrel really need baths! The oh so few drops that did fall didn't do the trick. With the air conditioner humming, we're all settled in for an early night. After two weeks in one place, our long day on the road was exhausting. Tomorrow we'll get back on the road early and head to Wyoming. 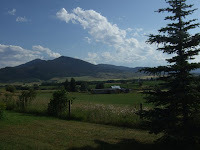 Many thanks to the great state of Montana. We'll definitely be back! On travel days with the moose, we try to keep our miles at less than 300. Today, we did just about that. 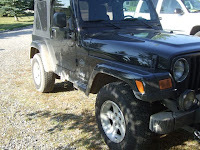 In the Jeep. 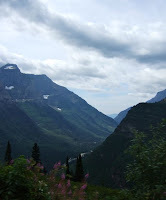 Glacier National Park doesn’t look that far away. And, really it isn’t. It’s less than 90 miles. It’s simply much bigger than it appears on the map! 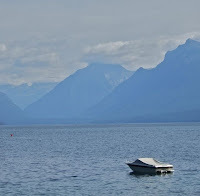 Our route took us up the eastern side of now familiar Flathead Lake to West Glacier. There we entered the park, took a gander at peaceful Lake McDonald, picked up a couple of maps and headed for the Going to the Sun Road. 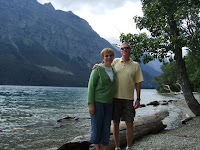 Our first stop was the waters just above Lake McDonald, the aptly named McDonald Creek. 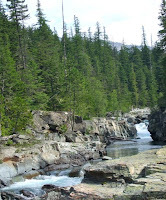 This was one of many small creeks and falls we saw in the park. My mom is a self-proclaimed acrophobic. 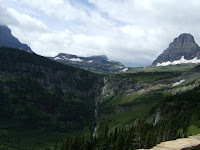 This is important because when she encouraged us to make Glacier National Park a stop on our Montana journey she said the Going to the Sun Road was a drive we wouldn’t want to miss. She and Dad made a second pass through this area just a few years back. “When you go,” she added, “remember that I did the driving on that road.” Thinking of her on our journey today, I made an early assessment of our journey to the sun. This picture sums it up: straight, wide and fairly broad shoulders. And, Mom had a problem with this? Heaven’s Peak was peeking through the clouds for just a bit. 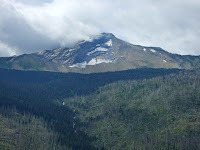 Much of the area in this part of the park was destroyed by the Trapper Fire of 2003. We kept climbing up the road and taking in the views. Remember, this photo doesn’t do it justice. Time for another road assessment. Oh! This is what mom was talking about. 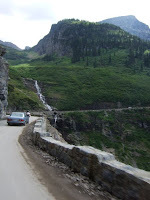 Narrow road, hairpin turns, a short little rock wall and a long, long way to fall. 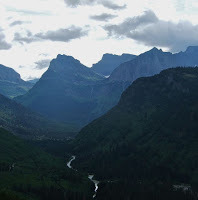 At Logan Pass we crossed the Continental Divide at 6,646 feet. There we had a decision to make: Go back the way we came or keep heading east to St. Mary. Although it was definitely the long way, we decided to head east and keep enjoying new views. 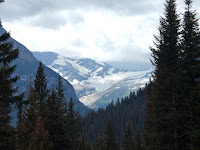 The best view of a glacier on the Going to the Sun Road is this look at Jackson Glacier. Again, the picture doesn’t do it justice. You’ll just have to head this way and see it for yourself. 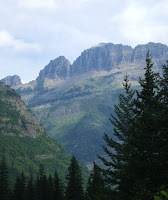 Shortly after leaving St. Mary Lake, the canyon walls of Glacier National Park were in the rear view mirror, and we were on the far east side of the park. Rather than taking a return trip on Going to the Sun, (Once is enough, thank you.) 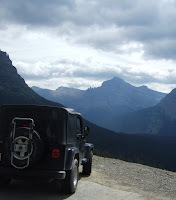 we circled the park to the south on a 100-mile journey back to West Glacier. 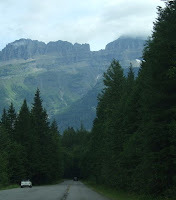 Along the way, just as we were slowing down to at East Glacier, I saw something out of the corner of my road-weary eyes. Out of the bushes just off the road up popped a black bear! We didn’t get a picture, but Paul was my witness as he saw the big beast lumber across the two lane road behind us. Unlike the stoobies we saw earlier today, we can say we actually a saw a bear - up close and personal. No binoculars needed! Our bear encounter gave us just the adrenaline pump we needed to make one more stop on our long Jeep drive home: Hungry Horse Dam. And, just for the record: We'll take 300 miles in the moose over the squirrel any day. Hands down!